Fall and winter mean Oyster Season in the South. With the humidity lowering and the cool breezes of fall blowing in, there is nothing better than sharing an oyster roast with friends and family. Oysters from Beaufort County are unique in flavor with a salty sweetness unrivaled by oysters from any other area. South Carolina’s coast is home to Eastern Oysters (Crassostrea virginica). Eastern Oysters can be found in our intertidal zone and, thus, are very tolerant creatures. They can withstand great variations in air exposure, temperature and salinity and are a keystone species for our estuary systems. This means that when the oysters are strong and healthy, so is the rest of the ecosystem with oyster reefs providing habitat to over 120 varietal species, such as fish, shrimp, crab and other mollusks. They eat by filter feeding phytoplankton out of the water column and are the best water filter we have in South Carolina. 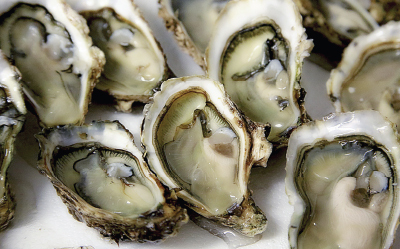 One oyster can filter about seven gallons of water per day! 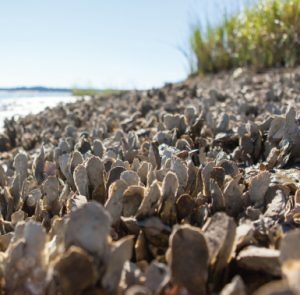 Oyster reefs also protect our islands and mainland by acting as natural breakwater, absorbing wave energy that could potentially be harmful to our waters. Reproduction takes place in the summer months when the water temperature is greater than 68 degrees. Male and female oysters release reproductive material into the water column, creating free-swimming larvae called spat. This spat will be carried through our waterways by tides and currents looking for a hard substrate to attach itself to. The best thing for spat is to attach to another oyster shell, but they can also fasten on to wood, concrete or other forms of shells. Once the spat has found a suitable clutch, it will develop a full shell within 12-24 hours. Oyster populations are declining all along the Atlantic Coast. Over-harvesting, water pollution, coastal development and wake from recreational boats all contribute to the decline of Eastern Oysters. Tens of thousands of bushels are harvested off of the Atlantic coast each year, but less than 10 percent of the harvested shells are returned to our waterways. Without these shells being placed back into the water, the oyster spat are finding less clutch to grow on. 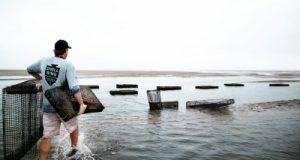 South Carolina Oyster Restoration and Enhancement (SCORE) is a program started by the Department of Natural Resources (DNR) of South Carolina to increase our oyster population. Volunteers work together to plant clutch material in order to recruit more juvenile oysters. They have also established oyster recycling facilities, where both businesses and individuals can deposit used shells, to be placed back out into our waterways. Since May of 2001, 8,000 volunteers with 500 tons of shells have built 188 reefs along our coast. Old shells are quarantined for up to six months, and then are placed into plastic mesh bags. These bags stop the shells from breaking down and will become part of the reef. There are designated areas, usually in tidal creeks and adjacent to salt marshes, where the bags are placed. 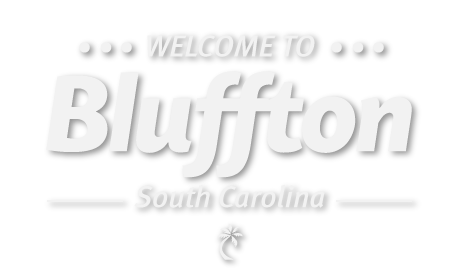 Local shell recycle bins can be found in Bluffton at Trask Landing, as well as Beaufort County Public Works in Beaufort. It is advised to separate trash from the oyster shells. Do not put shells directly back into the water, they may have contaminates that can do further damage to the environment.